The wait is over for guests looking to get their thrill fix on Kings Dominion’s newest roller coaster, Twisted Timbers. Wood and steel intertwine into twisting barrel roll drops, dynamic inversions and gravity-defying weightlessness on the park’s newest coaster, which is set to open to the public on Saturday, March 24. Twisted Timbers is located in the Candy Apple Grove section of the park and is themed to an abandoned apple orchard on the edge of town. The story behind the coaster is that an unknown force – supernatural or natural– destroyed the harvest years ago and froze the orchard in time; now the strictly “off-limits” orchard has reopened for tours, with the twisted ride as its highlight. Busch Gardens Williamsburg has revealed exciting details about its new virtual reality ride, debuting in spring 2018. The park’s newest attraction will be called Battle For Eire™—Action VR Ride. The revolutionary VR attraction will feature a fierce fairy warrior named Addie, who will lead riders on an unforgettable adventure through her homeland, Ireland. A host of characters, some heroic and some villainous, join Addie in a thrilling story fit for the whole family. Addie’s goal is to rescue the Heart of Eire, which represents the magic of Ireland, but she needs a little help from the park’s guests. Located in the Ireland village of the park, Battle For Eire is a marriage of a motion-based theater simulator with state-of-the-art 360-degree virtual reality headsets, creating an innovative experience unlike any other in the attraction industry. Riders will be completely immersed within the story and be able to see, hear and feel actions happening all around them, both through the virtual reality headsets and within the motions of the simulator. Wood and steel intertwine into twisting barrel roll drops, dynamic inversions and gravity-defying weightlessness on Kings Dominion’s newest hybrid roller coaster – Twisted Timbers – slated to open in the spring of 2018. This winter, the Santa tracker will have a new destination: Six Flags America, just minutes from Washington, DC. 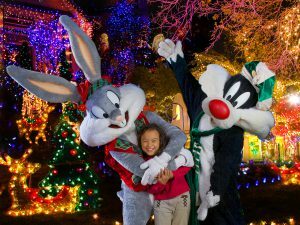 Millions of glittering lights, dazzling holiday entertainment, delicious seasonal treats, Santa’s Village, and many popular rides will magically transform the popular theme park into a winter wonderland for the region’s first-ever Holiday in the Park® celebration. The park will be open weekends and select days November 19 through January 2, 2017, giving visitors a completely new way to enjoy the most magical time of year. Holiday in the Park will provide an escape from the hustle and bustle of the shopping rush, and a way for guests to create their own magical, memorable holiday moments. A visual feast will await just inside the gates, as six areas of the park undergo a massive makeover that showcases the world’s best holiday traditions. Each area will be an emotional journey and bring the warmth of the season to guests in an entirely new way. Stunning light displays; illuminated, towering trees; the iconic smells of fresh pine and crisp peppermint filling the air; and festive vendors offering sweet and savory treats will provide a multi-sensory journey of winter delights. Kids can join Santa in his workshop for a fun photo opportunity. A new entertainment program will feature a grand stage production, hilarious stunt show, live carolers and of course a special show just for kids. 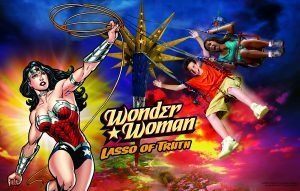 Based on the world’s most iconic female Super Hero, WONDER WOMAN Lasso of Truth is an extreme swing ride that spins guests in a 98-foot circle at speeds of 40 miles per hour atop a24-story tower. With a capacity of thirty-two riders, guests sit two across in open-air swings as they climb to the top of the tower while spinning round and round, offering a breathtaking view while soaring high above the beautiful Maryland and D.C. landscape.